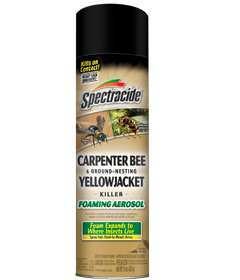 The Spectracide Carpenter Bee and Ground-Nesting Yellowjacket Killer Foaming Aerosol features an expanding foam spray to provide coverage in hard-to-reach areas. This spray is designed to kill yellowjackets and carpenter bees on contact. It is a violation of Federal law to use this product in a manner inconsistent with its labeling. For residential use only. Do not allow people or pets to contact treated surfaces until dry. Do not water the treated area to the point of runoff. Do not make applications during rain. All outdoor applications must be limited to spot or crack-and-crevice treatments only. Insert extension tube into nozzle. Point extension tube at target location and away from face. Push button to dispense foam. Apply evenly, avoid dripping and runoff. Treat active tunnels where carpenter bee activity has been observed. Leave the entrance hole open for 48 hours after application to allow the bees to contact and distribute the insecticide throughout the nest galleries. Then plug the entrance hole with a piece of wooden dowel coated with carpenter’s glue or wood putty. Plugging the hole will prevent reinfestation of old nesting tunnels and reduce the chances of wood decay. Using attached extension tube, spray product directly into holes in ground where yellowjacket activity has been observed. After 24 hours, cover the hole with soil. For best results, spray early in the morning or late in the evening when yellowjacket activity is low and most yellowjackets are in the nest. Note to Physician: Contains petroleum distillates – vomiting may cause aspiration pneumonia.